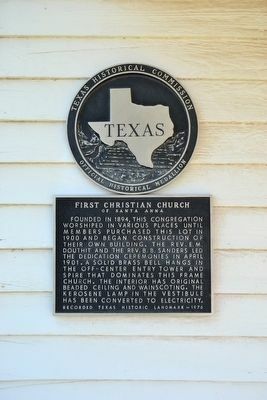 Founded in 1894, this congregation worshiped in various places until members purchased this lot in 1900 and began construction of their own building. The Rev. E.M. Douthit and the Rev. B.B. Sanders led the dedication ceremonies in April 1901. A solid brass bell hangs in the off-center entry tower and spire that dominates the frame church. The interior has original beaded ceiling and wainscoting. The kerosene lamp in the vestibule has been converted to electricity. Location. 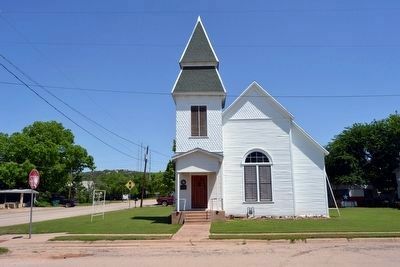 31° 44.34′ N, 99° 19.32′ W. Marker is in Santa Anna, Texas, in Coleman County. Marker can be reached from the intersection of Avenue C and 1st Street (Farm to Market Road 1176), on the right when traveling west. Touch for map. Marker is at or near this postal address: 508 Avenue C, Santa Anna TX 76878, United States of America. Touch for directions. Santa Anna, C.S.A. (approx. ¼ mile away); Santa Anna Veterans Memorial (approx. 0.3 miles away); The Turner House (approx. half a mile away); Santa Anna Cemetery (approx. 0.6 miles away); Emma Daugherty Banister (approx. 0.6 miles away); John R. Banister (approx. 0.6 miles away). Touch for a list and map of all markers in Santa Anna. More. Search the internet for First Christian Church of Santa Anna. Credits. This page was last revised on June 16, 2016. This page originally submitted on May 10, 2016, by Duane Hall of Abilene, Texas. This page has been viewed 190 times since then and 4 times this year. Photos: 1, 2. submitted on May 10, 2016, by Duane Hall of Abilene, Texas.